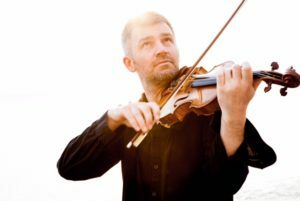 Saturday’s all Sibelius programme presented by the St Albans Symphony Orchestra under its conductor Tom Hammond had all the makings of a rare treat. And treat it was for the orchestra excelled with an evening of very fine music making. The programme could hardly have been better, with the epic and nationalistic tone poem Finlandia as its opening and Sibelius’ remarkable violin concerto to follow with his great Symphony No 5 to finish. Finlandia’s powerful brass opening was just a taster for the excellent musicianship that came from the orchestra during the entire concert. The whole performance gripped the audience in St Saviour’s Church. But it was only a taster for the truly outstanding performance of the violin concerto that was to follow. The solo violin enters almost Instantly in the superbly tranquil opening and David Le Page, making his second appearance with the orchestra, instantly showed this mastery of this epic work. Unlike many concertos where soloist and orchestra work as equal partners, this is a work when the soloist if very much to the fore. And David’s superb playing ensured that every moment was a thrill. The incredible extended coda the first movement demonstrated the soloist’s complete mastery of his instrument and of the work. Although the soloist is supreme in this work, it is still demanding of the orchestra which did a tremendous job and conductor Tom Hammond ensured a first-class balance throughout. The second half opened with the brief but beautiful Scene with Cranes, which Sibelius wrote as part of the incidental music for a play by his brother-in-law Arvid Jarnefelt. The outstanding feature is a very fine violin solo played by orchestra leader Jennifer Wigram. Written as a commission from the Government of Finland to celebrate the composer’s 50th birthday, Sibelius’ Symphony No 5 is one of his best-loved works and Tom Hammond was a man in complete sympathy with it in his interpretation.